You know what’s gross? When you baby sticks their hands in their poop while you are trying to change their diaper. And you know what, every baby does it at some point or another. If you have a fussy baby, wiggly baby or curious baby you should get the Halo SwaddleChange. The Halo SwaddleChange is a soft plush changing pad cover that has a sewn-in swaddle wrap to help parents keep baby’s body under control while he’s lying down. I love how soft the material of the swaddle change is, very comforting for baby. The swaddle allows you to wrap baby’s arms while still giving you plenty of access to the diaper area. The swaddle is great for keeping younger babies feeling secure and warm and prevents older babies from wiggling so much. The only thing I would change is to make the swaddle a little bigger and put the rough part of the velcro facing away from the baby as it can scratch little baby arms if not aligned properly. The SwaddleChange is available in Cream, Sage, Pink and Blue velboa fabric and fits most contoured changing pads (17″ x 32″ to 17″ x 34″) The SwaddleChange has been awarded the PTPA (Parent Tested Parent Approved) Seal of Approval. 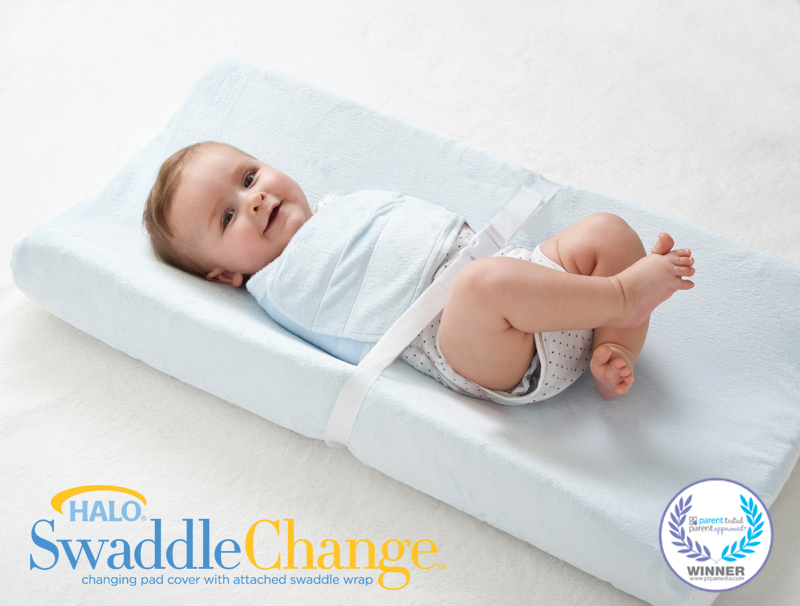 The Halo SwaddleChange is available on Amazon.com and at other select national retailers. Giveaway ends on February 22, 2012. The winner will be chosen using random.org and announced on this post. Entrants must be 18 or older. Winner to be chosen at random. Winner will be notified by email and has 48 hours to respond or a new winner will be chosen. See giveaway rules for more information. Disclosure: I received the featured product and compensation in exchange for my honest opinion. The opinions expressed in this post are my own and not influenced by the company. I like the blue but all the colors are nice!! I like the Sage color! The Cream color looks nice. I would love the blue! Baby #3… a boy, is due this Spring! I would love to win the cream colored one. I would pick sage because it’s gender neutral. I would love to win Sage!